The Small Magellanic Cloud (SMC) is a dwarf galaxy. It has a diameter of about 7,000 light-years and contains several hundred million stars. It has a total mass of approximately 7 billion times the mass of our Sun. Some speculate that the SMC was once a barred spiral galaxy that was disrupted by the Milky Way to become somewhat irregular. It contains a central bar structure. At a distance of about 200,000 light-years, it is one of the Milky Way's nearest neighbors. It is also one of the most distant objects that can be seen with the naked eye. With a mean declination of approximately -73 degrees, it can only be viewed from the Southern Hemisphere and the lower latitudes of the Northern Hemisphere. It is located in the constellation of Tucana and appears as a hazy, light patch in the night sky about 3 degrees across. 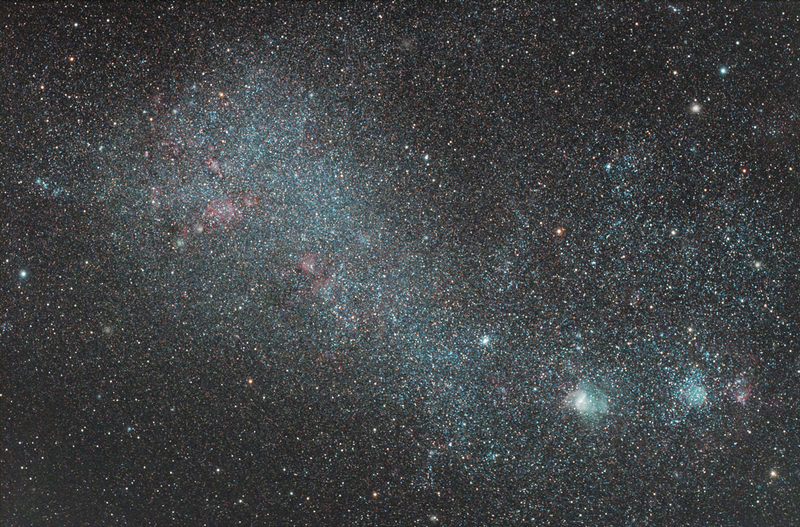 This was the first time we shot the Magellanic clouds. Being a part of everyone's life in the Southern Hemisphere, we were somehow proud to have the opportunity to make this picture.